We’ve already compared the best layered navigation extensions for Magento 2, but today our attention has been captured by another reliable solution from this field. 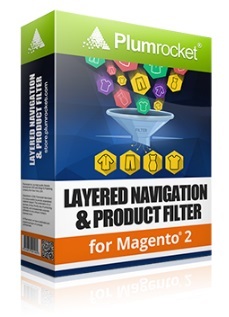 Meet the Layered Navigation & Product Filter Magento 2 module by Plumrocket. What features and improvements does the module provide? Below, you can find the answer. The first and the most important feature of every layered navigation extension is AJAX, and the Plumrocket Layered Navigation & Product Filter Magento 2 extension is not the exception. 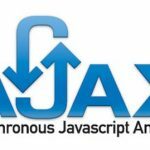 The module fully leverages all benefits related to the AJAX technology: your catalog pages become super fact and filters are applied without reloads! As a result, you dramatically improve shopping experience and decrease bounce rate. Another important aspect of the Magento 2 extension is its multipurposeness and flexibility. You can freely use the module with either small local website or with international giants. And it works equally well with or without pagination. According to Plumrocket, Layered Navigation & Product Filter copes with more than 80k products, over 1,2k products on one page, as well as 6k pages of pagination. You must admit that this looks impressive! And there are two ways to display a block with filters. As you might have guessed, the Plumrocket Layered Navigation & Product Filter Magento 2 module supports both vertical (left sidebar) and horizontal (top toolbar) navigation. Note that product filtering is also possible on a search page. Wide backend configuration is also among the extension’s strengths. 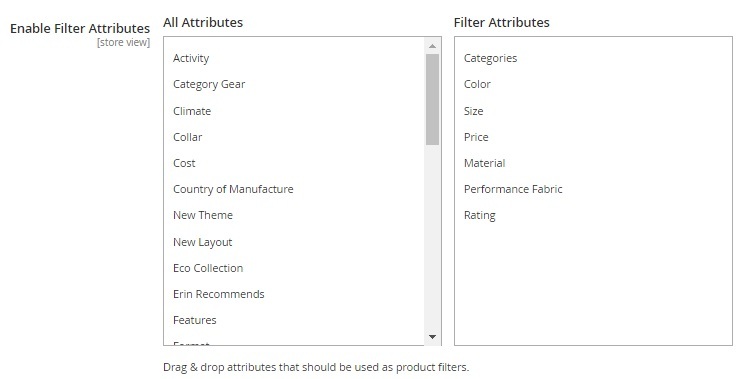 The module not only supports all product attributes and custom options, but also allows to create custom filters, set specific sort order, as well as group filter attributes and change their titles. Besides, as a Magento 2 admin, you can enable auto refresh, so the product list will be updated each time a new option is selected. Alternatively, store visitors can select all the necessary filter options and apply them simultaneously via the appropriate button (this method is less annoying, especially if a customer wants to apply a lot of filters). The aforementioned features seem to be quite common for top layered navigation modules, so let’s dive deep into the backend to get more information about the extension’s uniqueness. Go to Stores -> Settings -> Configuration -> Plumrocket -> Product Filter. Here, you can find two sections of settings: General and Filter Attributes and Customizable Options. 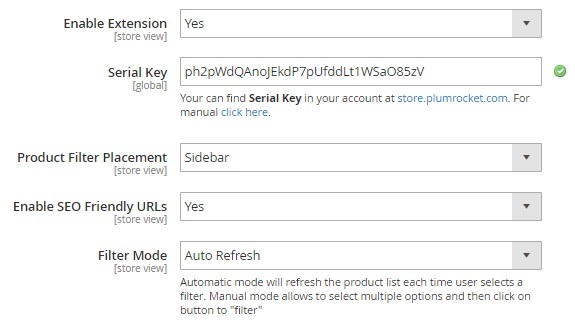 The first one allows you to enable/disable the Plumrocket Layered Navigation & Product Filter Magento 2 extension, enter your serial key and configure 3 important options. First of all, it is possible to select product filter placement here. As we’ve mentioned above, you can select between left sidebar and top toolbar. Although some Magento 2 modules allow to activate both options simultaneously, Plumrocket supports only separate usage of both placement types. Next, you can enable SEO friendly URLs. We highly recommend to activate the feature, since it will help to avoid problems related to the duplicate content issue. The whole store will be more SEO-friendly, so it will get a better position in a search result page attracting more visitors. Finally, you can select a filter mode. We’ve mentioned above that it is possible to enable auto refresh, so a category page will be updated each time a new filter option is selected. Think twice and choose between Auto Refresh and Manual Refresh options. As for the Filter Attributes and Customizable Options section of settings, it seems to be a little more complicated. First of all, it allows you to add filter attributes activating them on frontend as filters. There is a list of all available attributes on the left and a field where you can drag and drop necessary attributes creating filters on the right. Furthermore, with the Plumrocket Layered Navigation & Product Filter Magento 2 extension, you can group several product attributes together. It is only necessary to apply the same action as we’ve just described, but to drop a new attribute on top of the existing one in the right field. A new attribute group will be created. It consists of 2 product attributes and you can add more. Also note that Plumrocket allows to change the name of attribute groups. Just click on the existing name and start typing. Next, there is a similar sub-section for product customizable options. You have all customizable options on the left and filter customizable options on the right. Simply drag and drop customizable options that should become filters. 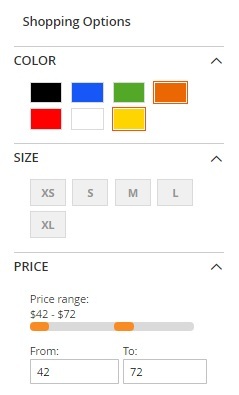 After creating all the necessary filters, you can choose a price display type. The Plumrocket Layered Navigation & Product Filter Magento 2 module allows you to select up to three price display types simultaneously. First of all, it is a price range. The extension creates it automatically and allows customers to choose the necessary range. Next, you can provide shoppers with input fields where they can enter minimum and maximum prices creating their own price range. And of course, there is a price slider – one of the most desired elements of advanced layered navigation. To make your layered navigation section neat and clean, set “Show empty filter options to “No” – you will hide product filter options with “0” results from the available options providing customers only with options that make sense. Before going to the frontend section, we’d like to shed light on one more feature provided by the Plumrocket Layered Navigation & Product Filter Magento 2 extension – category specific filter options. 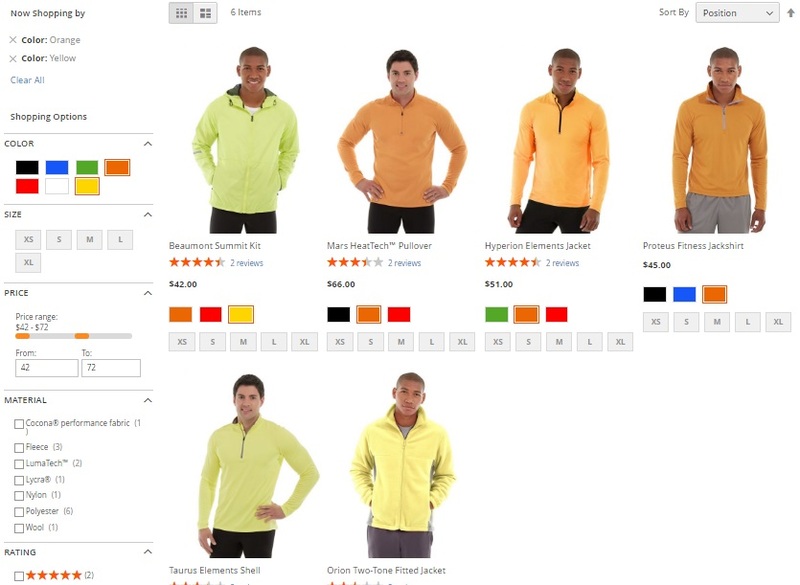 Go to Products -> Inventory -> Categories, select a category, and open Display Settings. Scroll down till its end and find “Disable Filter Attributes and Customizable Options”. 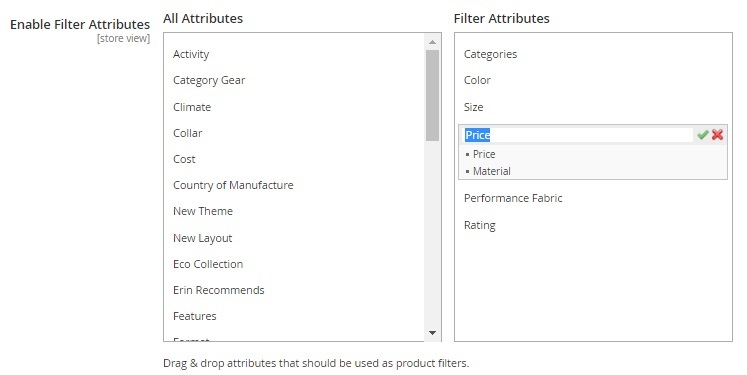 Here, you can disable certain product attributes and customizable options from being displayed as filters in the selected category.